Check out our Mini-Review of the House of Dosas. 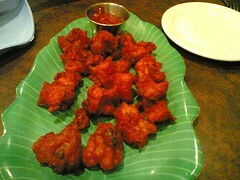 If you go, try the delicious Chicken 65 shown above! Check out Ken's review of Cafe Montmartre. By the way, my ex Nortel colleague, Lorraine Cobb, who is now game developer by day and bluegrass performer by night played there recently with the band she is in, the Mountain Bluebirds. Small world as they say! As promised in our last post about Kiwi Pie company, here are some photos (more on our Kiwi Pie Company Flickr Photo set). On a walk in the old 'hood with the kid today, we strolled past Moderne Burger and Dan. To my surprise, both restaurants are closed for renovations due to a fire in the store between them. I hope they are up and running again soon! 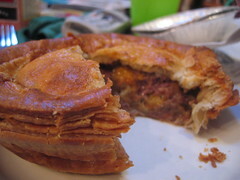 Barb and I tried the chicken and lamb pies from the Kiwi Pie Company (#2, 3337 Kingsway, 604 454-1914). Mmm. Two for $6 on Monday and Tuesdays, such a deal and $4 per pie after 4p.m. More later (including photos) when I get over my cold which probably won't be until Friday! Hmmm. Maybe if I go to visit Richard out in Burnaby, I can go check out Bombay Bhel with him. Tempted! I received an email from Meg Sheldon, the publicist (note to other publicists, we would prefer that you put this material on your website so that we can link to it!) 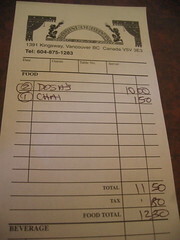 for Ch'i Restaurant and Lounge (1796 Nanaimo (at 2nd), 604.215.0078, tuesday-sunday 6pm-11pm ) which opens tomorrow. Apparently (according to Jeni, whose family bought the Teatriz Cafe), the Teatriz Cafe in Richmond is no longer green (back in my Nortel Richmond days, we used to call it the "Green Place"). It's now yellow and the new owner is a former Sun Sui Wah chef. Check out my updated Mini-Review: Teatriz Cafe for the full scoop from Jeni. Cool. Going to have go to "The Yellow Place" and write an update. Green Grape Restaurant for sale?!? It appears from the photo above that the Green Grape Restaurant (a few doors down from Pondok Indonesia on Commercial Drive) is for sale. It's too bad. 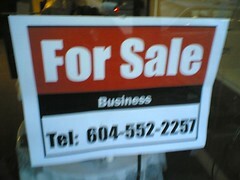 Read more about Green Grape Restaurant for sale?! ?